Southern Charm? | The World Through The Eyes Of An Idiot. ← Things Change, But Some Things Stay The Same. A change in my location (i.e. moving to Dublin) has meant having to find a brand new team to help and assist me in solving the world’s problems, and I have been lucky enough to grab Liam and Sue for this episode. I hope you like their input as much as I did. I thought they were awesome. You did too, didn’t you? Didn’t you? These ARE the droids you are looking for. Finally, before you all run away to get straight on to the iTunes and Stitcher thingies, I have to say a massive thank you to Jess, Mark, Brad and Emma for the first 7 episodes and all of their creativity, humour, time and help. I might mess around saying how rubbish they are or how I have had them imprisoned, but they are fabulous and I couldn’t have got started without them. And not forgetting Loki T Dog too. Massive thank you to everyone, new and old, for all of the help you have given to me and the show. Finally…… More passionate outpourings of gratitude to everyone who has listened, downloaded, subscribed, contributed and commented/rated. It might seem like a small thing that may go unnoticed, but I can assure you that anyone who does a podcast is EXTREMELY grateful for you taking notice of them. Give someone a nice comment or rating today. Preferably me. Go on. 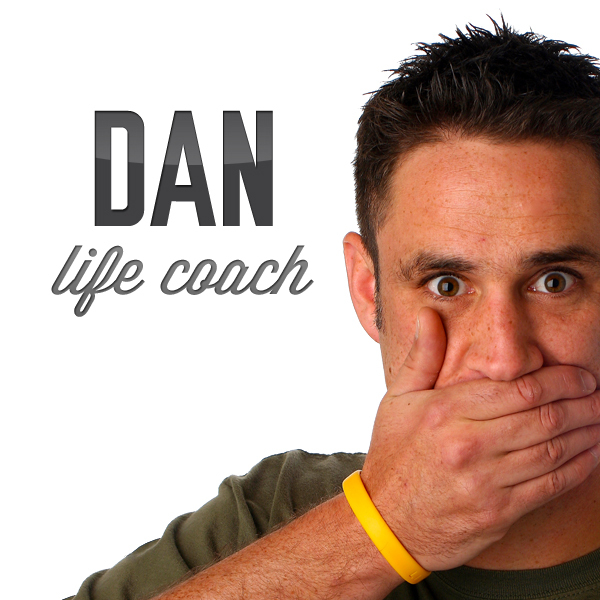 Listen to Dan Life Coach on iTunes here. Listen to Dan Life Coach on Stitcher Radio for Android here. And you can find out a little more about Dan Life Coach here.